Understanding and complying with the PCI Data Security Standard (PCI DSS) can be a daunting task - especially if your organization has limited time and resources. The new PCI DSS 2.0 standard, which took effect Jan. 1, requires testing a virtualized environment to ensure that if you put multiple accounts onto a single processor, there is still segregation of data and all the data is protected. Many organizations have already gone forward with virtualization products and strategies without first establishing standards or ensuring they have the proper tools in place. With such strict requirements now in operation, these organizations risk failing PCI audits if they don't pay close attention to the new updates and implement the correct procedure.. In this discussion we will address the challanges and opportunities companies face under the new standard. Our expert panel will discuss PCI compliance best practices, and we will take a QSA's look at specific virtualization security recommendations. Attendees will learn how taking a risk-based approach to the security assessment process will help you achieve PCI DSS 2.0 compliance. Brandon Dunlap, John Kindervag (Forrester), Arti Raman (Agiliance). 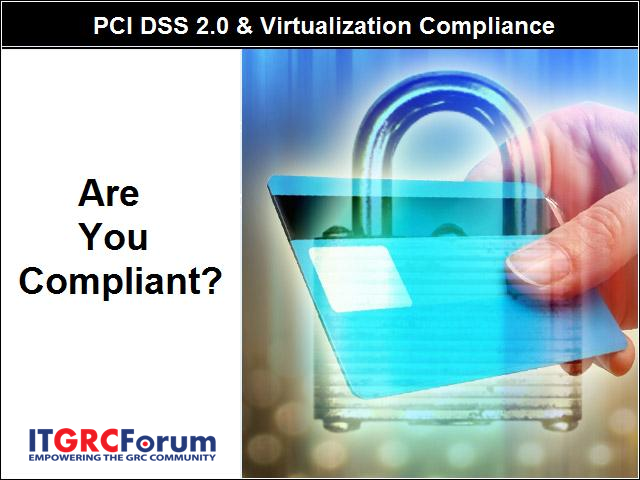 Title: PCI DSS 2.0 & Virtualization - Are You Compliant? Presented by: Brandon Dunlap, John Kindervag (Forrester), Arti Raman (Agiliance).